The majority of August was spent adding language features, fixing bugs, writing documentation, and listening/responding to community feedback. We did a lot this month, so this update is going to be a long one. The Eve platform saw rapid improvements over the last month as we quickly responded to user feedback. As is the case when all projects are set loose in the wild, we encountered stability, performance, and usability concerns almost immediately. Let’s take a look at all of the work put into the Eve platform first. Surprisingly, one of the most difficult aspects of developing a language is deciding on the words and verbiage used to describe Eve concepts. Choosing the wrong words can alienate users and make things more confusing than they need to be. Therefore, we’ve spent countless hours looking through thesauruses and dictionaries for the perfect words. In presenting the language to new users, we’ve learned some of the choices that made sense to us didn’t make sense to others. For instance, we used to talk about “freezing”, but community feedback suggested that word didn’t provide an intuition for how that command actually worked. Whereas most languages use functions to accomplish code-reuse, Eve takes a different route; our records obviate the need for most functions. Therefore, we don’t fully support user defined functions at the moment. Nonetheless, functions are useful for primitive operations, like math or string manipulation. Thus, we adjusted our function syntax to look a little more like the record syntax. which is a record like any other. The new function syntax uses the value attribute as an implicit return, so functions can be inlined into expressions. We’ve started thinking more about how modularity will work in Eve. For a while now, we’ve had a concept of “databases” (formerly bags), which are just containers of facts. So far, we’ve only exposed two databases: a default “session” database and a “global” database. The global database was exposed to users via commit global, which directed committed records to a global database accessible by any session on the server. This would select every #person from two different databases, essentially merging two databases. We still have a lot of work to do here, so this feature is not available on the master branch yet. Stay tuned for an RFC coming next month on modularity. Eve cannot thrive in isolation, so we need a way to communicate with the outside world. We’ve done some work on this front, adding the ability to read/write files, handle JSON (opening up the ability to interact with any JSON compatible API), and handle HTTP requests. This work is available in the process branch. What’s nice about our solution here is that interacting with the outside world doesn’t look or feel any different than interacting exclusively within Eve; you still match and modify records, except the facts in those records originate from external sources. If you’ve been using Eve, then you’re already interacting with the browser through changing the DOM and handling events like clicks and keypresses. You’ll see here that we are interacting with both an external #http-request, and the file system through #path. Again, what’s notable is that despite interacting with data external to Eve, the code is written as if you were working entirely within the boundaries of Eve. You can check out the full program to see the rest of the implementation details. We added syntax highlighting to the built-in editor! One key feature of the Eve programming model is that the order of statements doesn’t matter. A nice implication of this property is that we can write Eve code in an order that makes sense for a human, as opposed to writing code in an order that is imposed by the compiler or runtime. This idea is the basis for literate programming, a practice for writing programs introduced by Donald Knuth in 1981. The idea behind literate programming is to treat a program as a document of prose written to a human audience, with code interspersed throughout. In writing this way, a programmer can use prose and formal methods to reinforce one another, leading to programs that are (in principle) easier to maintain. We talk about some of the benefits of literate programming here. Whereas other literate programming implementations require a “tangle” step to turn a literate program into a compilable program, Eve’s semantics mean a *.eve file can be rendered as markdown or executed by Eve without any additional compilation steps. We accomplish this by being CommonMark compatible; Eve programs are written just as you would write any markdown document, but code blocks containing Eve code are actually executable. Each of these blog posts are executable Eve programs “as-is”; just send them through the Eve compiler and they’ll run. 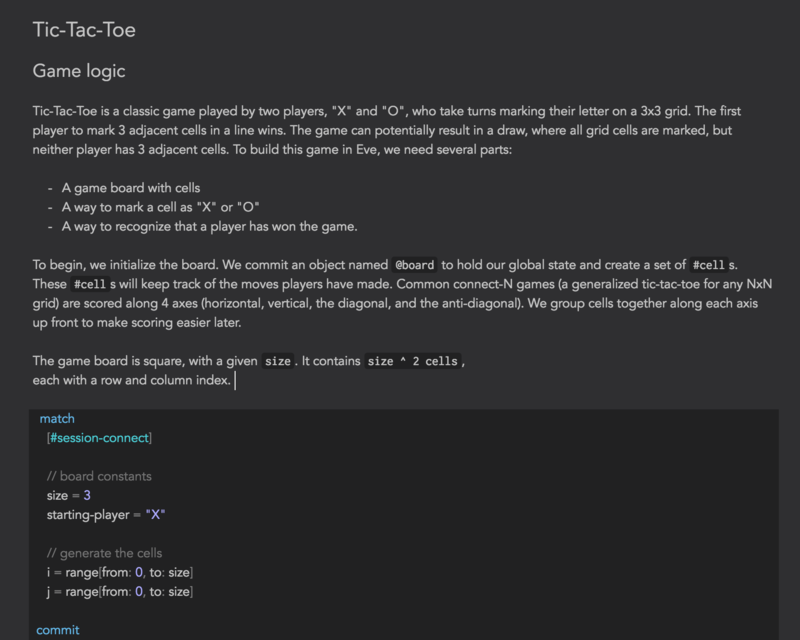 As Eve grows, we hope more people will join us in practicing literate programming, but there’s nothing about Eve that demands writing code this way; you can write programs with as little or as much prose as you prefer. We’ve been thinking a lot about what kind of graphical tools would be useful for working with the textual version of Eve. One thing currently missing from Eve is the ability to explore the contents of the Eve DB. Without this ability, Eve is as opaque as any other programming language. After all, the ability to inspect your program as it executes is one of the core features of our language. Here, we use #pixel (views used to be called pixels, so this would currently be accessed using #view) to inspect some records. Three views are displayed, one for each #clock-hand. In this case, since we’re inspecting records, the views display the attributes and values for each of the records. Then, we change to a different mode and look at the history of a specific attribute on #clock-hands, namely x2. This results in three graphs illustrating how x2 changes for each #clock-hand over time. Obviously, this is just a concept at the moment, but the core idea we like about views is how flexible they are. We can package some default functionality, like the record inspector and history illustrated here. But even more importantly this functionality should be trivially extended by the programmer. I’m especially excited by the engagement we’ve seen from the community so far. It’s hard to know exactly how many people are following our development and using Eve, but so far we’ve received comments and feedback from users in Sydney, Copenhagen, Moscow, Finland, Hong Kong, the UK, Germany, and many other places. Thank you to everyone who submitted a PR or an issue report. Specifically, thank you to @btheado, @bertrandrustle, @RubenSandwich, @frankier, @dram, and @martinchooooooo. Let me know if I missed anyone! The syntax RFC received a lot of activity this month, surpassing 100 comments from over a dozen users. Your comments have been well thought out, provocative, and very constructive, so thank you to everyone who has participated so far. Due to the feedback we received, we’ve already made several adjustments to the syntax, including changes to keywords and the general vocabulary of Eve (see above). Documentation is still in an early stage, but it’s improving daily. We put together a short syntax reference with all the necessary details to help you write Eve programs. Completeness - are there any missing gaps? Accuracy - is the handbook true to Eve? Exposition - is the document written in an order that helps people learn the language? We’ll be improving the handbook and other documentation daily, so keep checking back.